Cabin Creekwood Virginia cabin rentals are located close to the borders of the George Washington & Jefferson National Forest and Sherando Lake VA. Horseback riding in VA is a favored pastime of many visitors to the Shenandoah Valley. We offer a Family Adventure Package for a fun, adventure field family getaway that features a 1-hour trail ride on horseback (minimum age 6) for a great affordable price. Also included in the package is a picnic lunch for a day at Sherando lake, a backpack loaded with essentials and personal recommendations for what trails to hike. Of course, you do not have to purchase the Family Adventure Vacation Package to go horseback riding in VA while staying with us. There are several outposts where you can take a guided horseback ride with horses that are expertly trained to suit beginners needs, and there are several local stables that offer horse boarding if you’d like to stay in our secluded cabins for rent in Virginia and bring your horse! Families especially love making memories via horseback. Many people are surprised to learn that you can horseback ride in the national forests on the 1,290 miles of trails! Our Virginia cabin rentals are the perfect accommodations for horseback riders and vacationers looking for a family friendly and affordable place to stay. Several local stables offer boarding close to us. You won’t find a more secluded, natural setting to ride in. 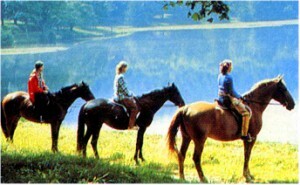 Horseback riding in VA in the national forests is allowed on open forest roads and on many of the forest roads that are gated (which prevents cars and trucks from using). The Ranger District office is a great place to contact if you have questions. According to the ‘rules’ of horseback riding in VA’s national forests hikers and cyclists are instructed to yield to horses, and horse riders are to be responsible for the control of their horse at all times. Riders should have current written proof of their Coggins test result and a test result for Equine Infectious Anemia.